Peel Vets|Advice|Farm|Condition Scoring Beef Animals – Why a Hands on Approach is Best. A hands on approach to checking the condition of animals is much more common in sheep farming, as the thick fleece interferes with viewing the body shape/condition and animals can become thin without this being obvious from visual inspection. However, it is much less often applied on a regular basis to cattle. During hectic days it is often easier to look at animals to monitor their condition, however a hands on approach can be much more accurate. Feeling how much cover there is over certain areas of the animal and assigning a value to this is known as Body Condition Scoring. Body Condition Score (BCS) can be assessed using different scales. For example, the most commonly used in beef cattle is a 1-5 scale, but scales of 1-9 may also be used. It is important when discussing scores with others that you say whether this score is out of 5 or 9. 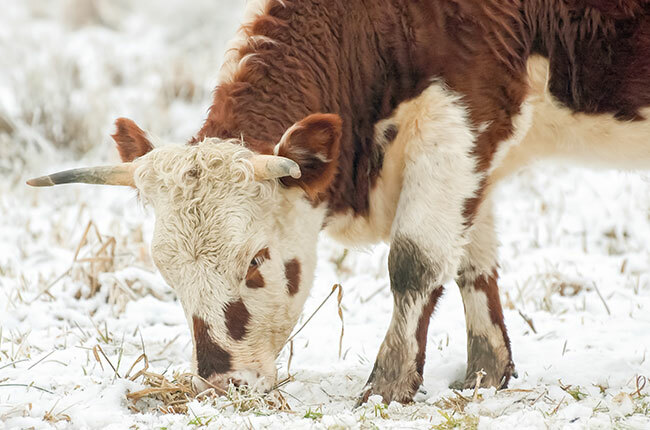 Some scoring systems involve simply looking at cattle, which may be enough in the summer months when they are turned away to the fields, however for unwell animals or in the pre-calving period, we would suggest a more hands on approach. Assessing BCS 60-90 days before calving, at calving and again at weaning will allow monitoring of the condition of the suckler cow. This is very important for making sure she is maintaining her condition at 2.5-3.5 as this improves fertility, nutrition for the calf and therefore stock growth rates and her immune system function. Grouping animals pre-calving by BCS helps to provide correct feeding so that BCS is correct for calving. Over conditioned animals (>3.5 out of 5) may struggle to calve as easily, whereas those under conditioned will likely produce less or poorer quality colostrum and milk. The BCS can also be used to assess the health of unwell animals and if this is checked and recorded regularly, this can be a useful tool in diagnosis. Examples of illnesses causing ill thrift include Johnes’ disease, high worm burden and fluke. Those with a BCS of 1.5 or less should receive veterinary attention. Accurate and useful Body Condition Scoring involves knowledge of the correct parts of the animal to check and how scores are allocated. This mainly involves feeling the bony prominences of the tail and loin areas. Consistency is key, so using a well-established scoring system that all farm staff are aware of and keeping records is best. If you would like to discuss Body Condition Scoring or would like any further information about this, please do not hesitate to contact the surgery.